In today’s post, I want to give a big shout out to Matt Sears of Hyacinth Games for sending a number of Wreck Age PDF downloads. Thank you. 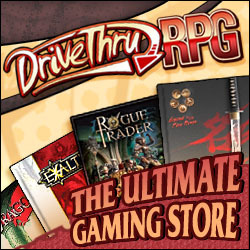 For those interested in attaining these rules at a good price, check out DriveThruRPG. Wreck Age is a game that I have heard about before, but never actually investigated before. The core book itself is fairly hefty. It is 244 pages long and filled with Fluff, a Skirmish Game and an RPG. That is right folks, the guys at Hyacinth Games combined an RPG and Miniatures Skirmish Games into one book. 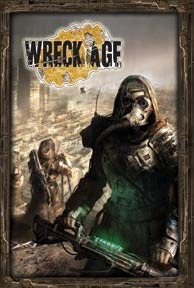 Cover of Wreck Age. Image from Hyacinth Game’s Website. To me, combining an RPG with a Miniatures Skirmish Game into the same book is an excellent concept. I was playing RPGs well before I ever got into miniatures and I can remember plenty of times when I was a young kid trying to convert Rifts and D&D into what would best be considered a miniature skirmish game through pens, paper and imagination. An interesting fact is that RPG Miniatures are also the first miniatures that I ever bought and painted. Now back to Wreck Age. 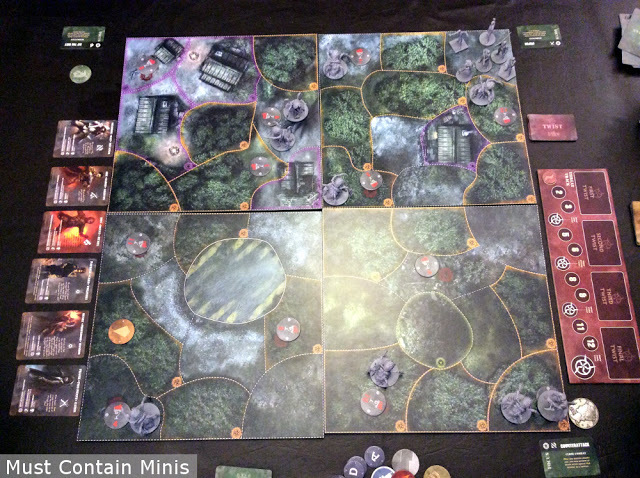 In Wreck Age, players can choose to play with the game as either an RPG or a Miniatures Game and even as a hybrid switching back and forth between the two styles. That, I think is an extremely cool concept. There is lots to consider in this game. Several factions are presented in the core book but it looks like just four of them are ready to play right out of the rule book. Characters get skills and perks on top of their attributes and weapons can malfunction. At a quick glance, the rules to both the RPG and especially the Skirmish game appear to be fairly deep. 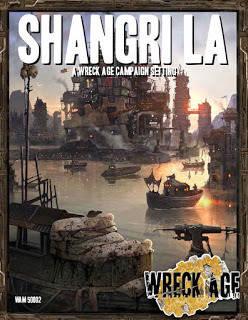 Lately, the guys at Hyacinth Games have been promoting their new book – Shangri La – which provides a new campaign setting for Wreck Age. As one can tell from the cover, Ports and Ships are a big part of this expansion. 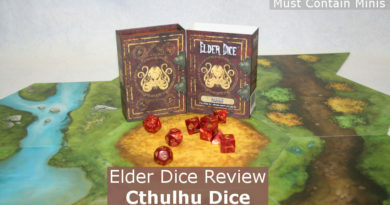 This expansion does not provide new rules but instead delivers an interesting campaign setting for players to explore or inhabit. Cover of Shangri La. 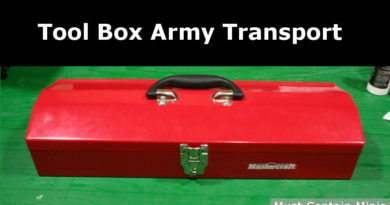 Image from Hyacinth’s Website. Both these books were quite enjoyable to thumb through. My readers will know that I am not a Fluff guy, and I found that Fluff is a big part of these books. That said, the Fluff presented here is well written and enjoyable to read. There are many points within that a crafty Narrator could easily flush out into an interesting campaign game. Overall, I found these books to be interesting and very fun to look through. Anyone that likes reading Fluff or who is looking to play an engaging game in a Post-Apocalyptic World will likely get enjoyment out of these books. Be forewarned that the game is a deeper level skirmish game than other products on the market and the books are very heavy in text. To many gamers, I could see the above forewarning being a positive thing as there is a lot of meat to this game. But for those that buy games hoping for a lot of artwork, they could be disappointed because there is a lot of text and the quality of artwork is inconsistent throughout the books. Oddly enough, the artwork itself is fantastic in spots, but not nearly as refined on other pages. To me, this game is very interesting. It is a deeper game than what I want to get into at this point in time, but I think there is a good product here. The Fluff is great and I could see a lot of people enjoying the books just to read the Fluff. The game itself seems very meaty and I think that it is really cool that it can be played as an RPG or as a Miniatures Game depending on the mood of the group. Although it is not a game that I intend to play at this time, it is a game that I am interested in and might pickup again in the future. For those that want to test the waters before buying, there are quick start rules available for free on Hyacinth’s website. These rules are also available on DriveThruRPG. Have you tried Wreck Age? If so, please tell me about your experiences with the system in the comments below.